There are two common trends with the round, pink puffball Kirby: he tends to appear in spin-off titles and usually stars in a game near the end of a Nintendo system’s life. 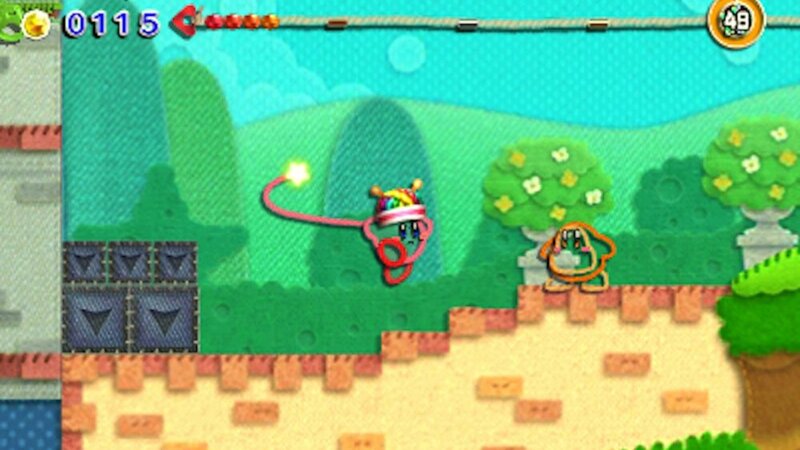 Kirby’s Extra Epic Yarn marks both check boxes as a spin-off swan song to the 3DS. It’s a port of a 2010 Wii title, but includes a few new bells and whistles to lend that “extra epic” feel. Unlike other offshoots, the game is a platformer much like the mainline series. However, Kirby is now made of yarn and lacks his trademark ability to copy enemy powers. That doesn’t stop the newly knitted star warrior from adapting to this crafted reality. Despite the 3DS’ lower resolution compared to the Wii, Kirby’s Extra Epic Yarn looks great, all due to the extremely charming visual design of a fabric universe. The world resembles an interactive diorama come to life. It was hard not to smile upon seeing this lovingly constructed world unravel. Backgrounds fold together when you pull a button string, and structures fall apart when you unzip them. The cleverly crafted levels incorporate fun themes, like toys, sweets, and space. It’s a shame stereoscopic 3D is absent, as I would have liked to see these yarn graphics pop out. The accompanying piano music is catchy and lends to the game’s easygoing tone. 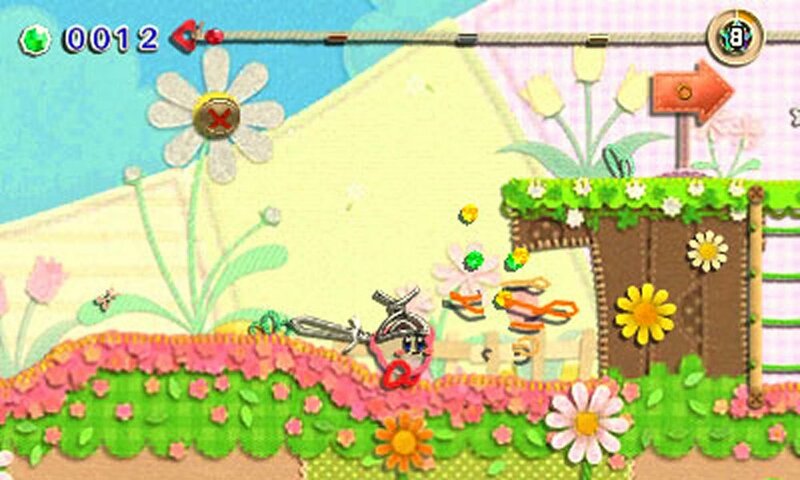 Gameplay is functionally identical to Kirby’s Epic Yarn on the Wii. Yarn Kirby can’t infinitely hover or copy enemy abilities. However, he still runs and floats downwards, adorably assuming the forms of a car and parachute, respectively. He also has a yarn whip that allows him to unravel enemies or knit them into yarn balls, which he can throw as projectiles. If this sounds more like a Yoshi game, then it should come to no surprise that developer Good-Feel went on to create Yoshi’s Woolly World and Yoshi’s Crafted World. It’s a testament to the level design’s strength that despite the limited moveset, every area feels distinct. Kirby swings across buttons like a monkey in one area and rides wool dinosaurs in another. In multiple levels, Kirby transforms into vehicles or creatures, like race cars, surfboarding penguins, and giant mech robots. These transformations are creative treats, except for the train, where instead of directly controlling it, you must draw a train track on the wall. One aspect that disappointed me about the original Wii game was its overly easy difficulty. The levels are simple enough to complete without trouble, but as a stinger, Kirby cannot die. He has no health bar, and getting hit or falling into a pit will only result in the loss of collectible beads. Then again, I’ve always felt like the real challenge came in trying to complete every area, collect every hidden secret, and earn top medals for amassing large amounts of beads unscathed. However, not everyone wants to collect 100%, but rather enjoy a moderately challenging experience where death has consequences. Enter Devilish Mode: a harder playstyle that gives Kirby a life bar. You can only take five hits before having to restart. Moreover, when you finish a level, your health points convert to a collectible; the more health you have, the better bonuses you receive. If you’re a completionist, you’ll have to beat every stage without getting hurt at all. In theory, Devilish Mode is a great catalyst for challenge, and I appreciate the option to play the entire game in this harder difficulty from the start. Unfortunately, one minor annoyance prevented me from enjoying the mode: a persistent devil that chases you throughout the stage, similar to Phanto from Super Mario Bros. 2 or the Angry Sun from Super Mario Bros. 3 – two enemies I dreaded as a child. The devil’s presence transforms the game from a soothing walk to a stressful pursuit. I wish there was an in-between difficulty that included a life bar without incorporating an annoying enemy. As a consolation, the devil can be defeated, albeit temporarily, with some of Kirby’s new powers. These Ravel Abilities compose the port’s second major addition, serving as alternative versions of Kirby’s usual copy powers from the main series. For example, Kirby wields a wire like a sword, throws buttons as bombs, and utilizes nylon to spin like a tornado. There are six power-ups that Kirby can find mid-level, and he gets to keep them between stages. Although Ravel Abilities tend to be overpowered for the original stage designs, they’re a blast to use and go a long way in making this spin-off feel more like a traditional Kirby title. With 29 levels, seven bosses, and 14 bonus stages, the story mode takes about eight to ten hours, though it takes quite longer to achieve 100%. A few minigames round out the package, including two brand new ones. 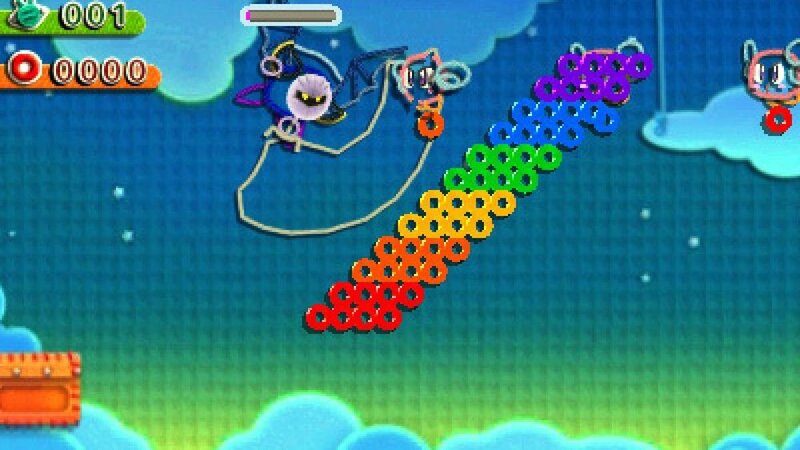 The first, Slash & Bead, involves playing as Meta Knight to fly around and slash everything in his path. Dedede Gogogo is a runner-style variation of the series’ Gourmet Race, where you guide King Dedede on a fast-paced race. In both minigames, the objective is to collect beads for high scores and crafting collectible images. They’re both surprisingly very engaging, and the sole downside is that they only have four levels each. The challenges, such as seeking hidden characters or speedrunning a level, return from the original release. In addition, the feature to use collected furniture to decorate your own apartment room à la Animal Crossing is back, with the added incentive to make fashionable designs to share on StreetPass. Not everything made it across to the 3DS port, however. Two-player co-op is sadly missing. There was a magic to experiencing this game with a friend, who would play as Prince Fluff (who has been demoted to a power-up granting NPC). It’s not a total loss as the game is plenty enjoyable solo, but it would be the one reason to pick up the Wii version instead. 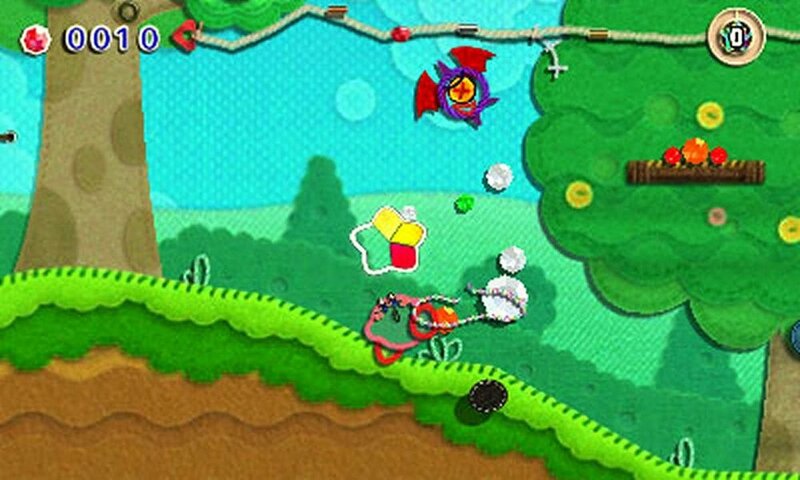 Kirby’s Extra Epic Yarn is a well-crafted sidescroller that gamers of all ages can enjoy. The 3DS port patches in a new difficulty and a novel take on traditional Kirby power-ups. They’re not as seamlessly stitched as they could have been, but they reveal the developer’s efforts in threading an ideal experience that improves upon the source material. With utterly charming visuals, memorable levels, and lighthearted platforming, Kirby’s spin-off knits together a worthy farewell to one of Nintendo’s longest-lasting handhelds. Shift DX takes one premise and remarkably makes it last for 200+ levels. Its healthy mix of spatial reasoning and platforming obstacles effectively tests your mind and reflexes. I’m convinced that this game stimulates a part of your brain that you rarely use, and it feels great. If you are even a casual fan of puzzle platformers, Shift DX will turn your world upside-down.